Hugh Keyte and Andrew Parrott, in The New Oxford Book of Carols, make the point that the refrain and seventh verse are probably later (and lesser) additions. The first and sixth verses probably represent the original refrain, with verses two through five being the original verses. 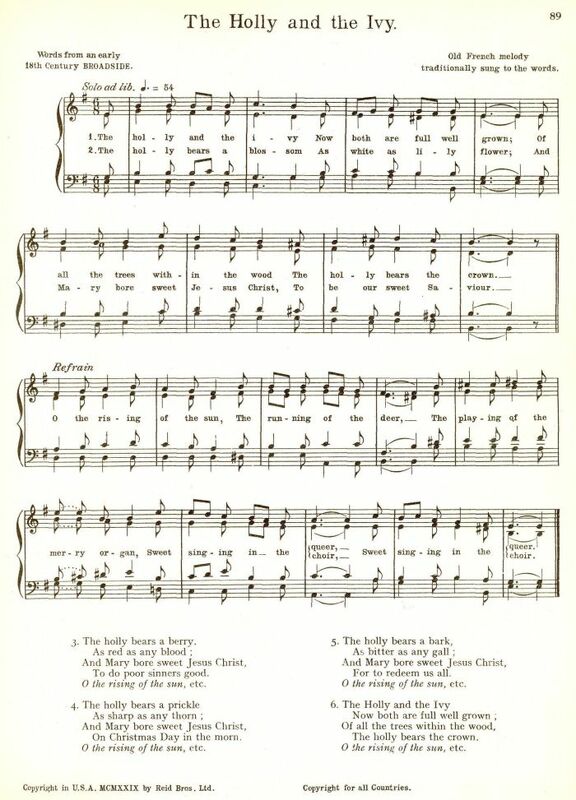 In this song, the holly stands for Christ, and the fourth line of the burden restates the ultimate victory of Christ over Satan and Sin: Christ bears the crown! Sheet Music from Henry Ramsden Bramley and John Stainer, Christmas Carols New and Old, Second Series (London: Novello, Ewer & Co., ca 1871), #23. 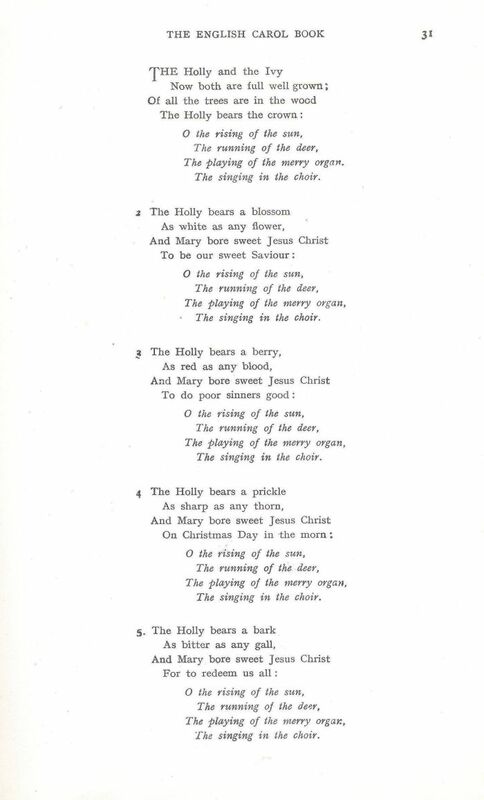 Sheet Music from Cecil Sharp, English-Folk Carols (London: Novello & Co., Ltd., 1911), pp. 17-18, from Gloucestershire. Sheet Music From Cecil J. 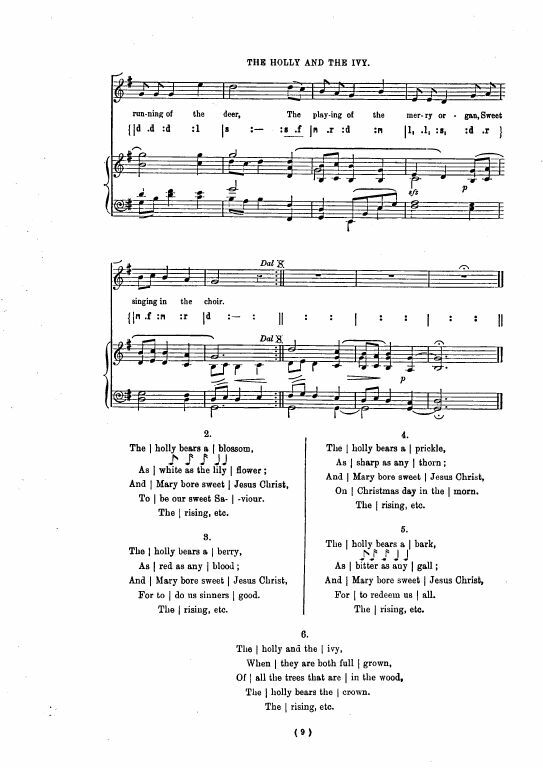 Sharp, Folk-Song Carols (London: Novello and Company, Ltd., 1913), No. 1177, pp. 8-9. Novello's School Songs, Book #245, edited by W. G. McNaught. Sheet Music from Ralph Dunstan, The Cornish Song Book (London: Reid Bros., Ltd., 1929), p. 89. Music from Henry Ramsden Bramley and John Stainer, Christmas Carols New and Old, Second Series, #23. 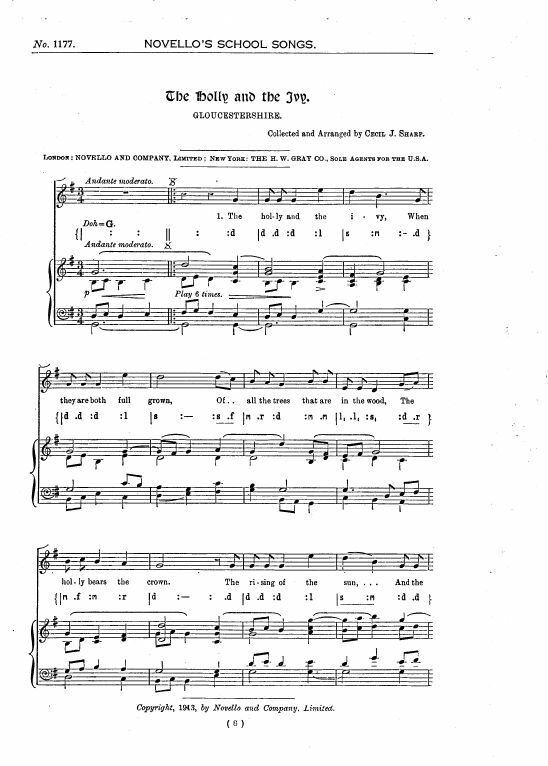 Several sources state that the first to print this carol was "Joshua Sylvester" (a pseudonym) in Christmas Carols Ancient and Modern (London: John Camden Hotten, 1861). 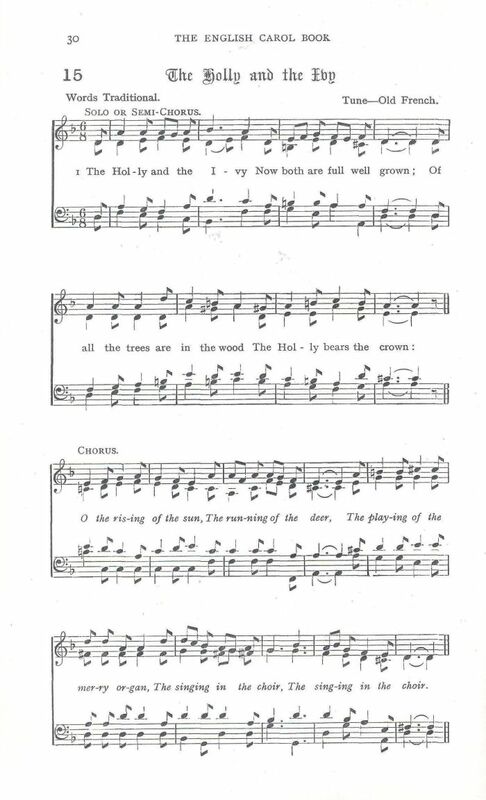 Note, however, that the 1901 and 1905 reprints omitted a considerable portion of the original volume, including this carol and a number of others on the same theme. The custom of decking houses and churches with evergreens, towards the close of the year, appears to be of very ancient date ; it being, in fact, one of those remnants of Paganism, which, although forbidden by the councils of the early Christian Church, had obtained too strong a hold on the prejudices of the people to be readily relinquished, as its transmission down to the present day serves to prove. 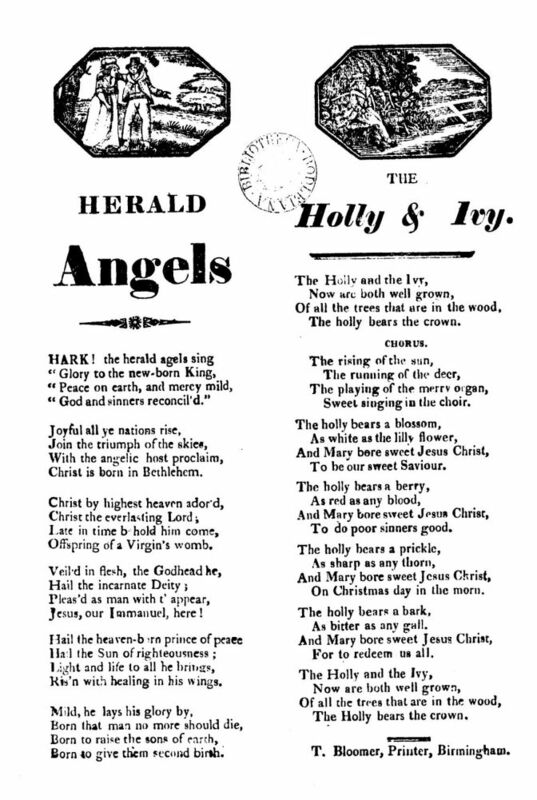 A longer listing of holly and ivy-themed carols is found at the bottom of the page. Also found in G. Walters, A Good Christmas Box (Dudley: G. Walters, 1847, Reprinted by Michael Raven, 2007), p. 27. An old broadside, printed a century and a half since, supplies the following. It does not appear to have been included in a collection before. The curious similes betwixt the holly and certain events in the life of Christ may yet be occasionally heard in the discourse of aged people. The Holly, from time immemorial, has been looked upon as a favoured evergreen, typical of the mission of Our Saviour. On mass days that in the church goon." But later writers almost invariably speak of the instrument in very different terms: -- we have the "pealing organ" of Milton; the "sacred organ" of Dryden; the "deep" organ's "majestic sound" of Congreve; the "deep-mouth'd organ" of Hughes; and "the deep, majestic, solemn, organs" or Pope. Editor's Note. The "one alone" spoken of by Husk was Joshua Sylvester, whose note is reproduced above. Part of the symbolism of the holly and ivy may be lost today when we can order flowers, but holly and ivy are rare in many parts of the world. Sung by Mrs. Mary Clayton, at Chipping Campden. I have supplemented Mrs. Clayton's words with those of another set recited to me by the late Mrs. Wyatt of East Harptree, Somerset. The only alteration that I have made is in the second stanza, substituting in place of the obviously incorrect "On Christmas day in the morn" (which Mrs. Wyatt gave me) the line given in the text which is the usual broadside rendering. 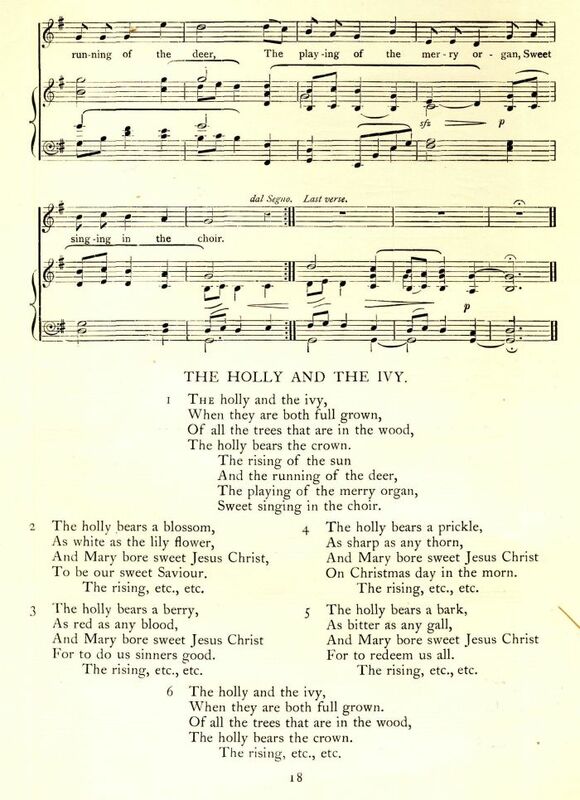 Variants of "The Holly and the Ivy" are printed in Bramley and Stainer's [Second Series, ca. 1871] and Chope's collections. The words are also on a broadside by Wadsworth of Birmingham. Also found in Edith Rickert, Ancient English Christmas Carols: 1400-1700 (London: Chatto & Windus, 1914), p. 267. Also found in Henry Vizetelly, Christmas With The Poets (London: David Bogue, 1851). This is one of a series of medieval English carols on the subject of the rivalry between the holly and ivy vying for mastery in the forest. These two plants came to be associated with the sexes, holly being masculine and ivy feminine. In this carol, the holly is used to represent various aspects of Christ's life and the ivy is not discussed at all. Pastor Prange also pointed out that Sans Day Carol, "Now the holly bears a berry as white as the milk," had a similar theme. Over the centuries, these distinction between the masculine holly and feminine ivy have, to an extent, been blurred (but see this curious account from 1779: Holly-Boy And Ivy-Girl). Holly and ivy became less the battleground and more the backdrop, although their decorative uses may also be of very ancient origin. Finally, the holly would also assume certain symbolism in the life and suffering of Christ. Its use at Christmas was seen as a presage of Good Friday and Easter. 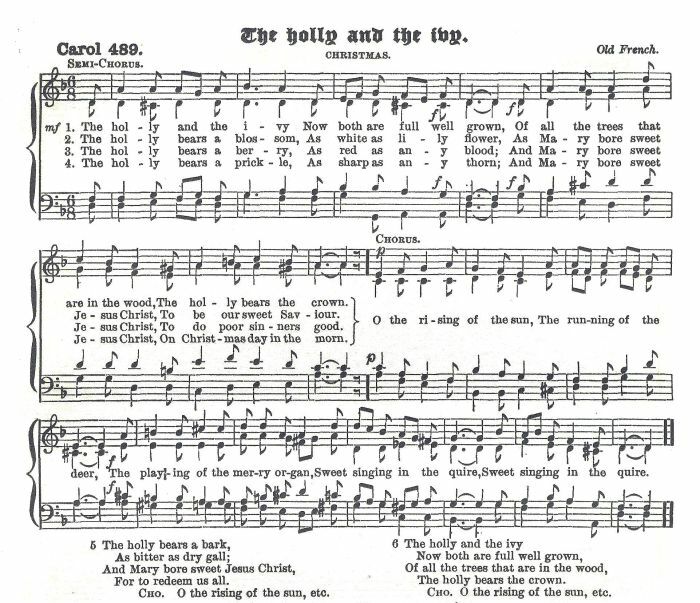 The Sans Day Carol (First Line: "Now the holly bears a berry") is a clear example. See also Modryb Marya - Aunt Mary. 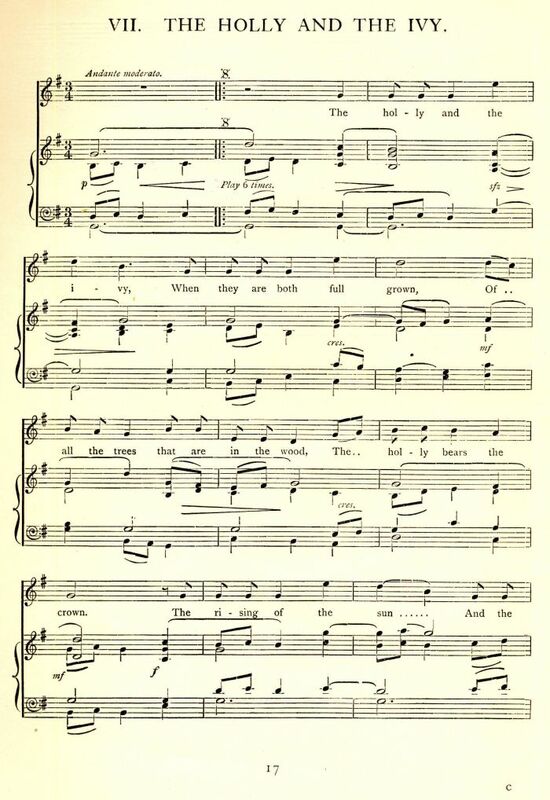 "Ivy ys good and glad to se" (First line: "Ivy is both fair and gren," Richard Leighton Greene, ed., A Selection of English Carols (Oxford: The Clarendon Press, 1962), #36, pp. 94-5. 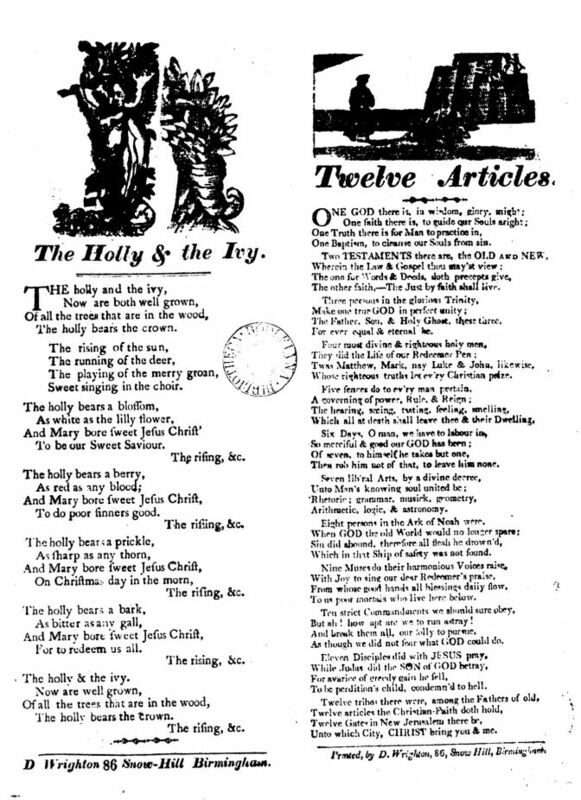 Holly and The Ivy, "Some go in for sporting, and other fancy balls," a secular song concerning the love of "sweet Bell and Rosy Lee." Oh, Here's To The Holly, First Line: "Oh, here's to the holly that cures melancholy." "Ouer all gatis that I haff gon," Richard Leighton Greene, The Early English Carols (Oxford: The Clarendon Press, 1935), #139, p. 95. John Brand, Observations on Popular Antiquities. With the Additions of Sir Henry Ellis. London: Chatto and Windus, 1888. Holly, Ilex, is any of several trees and shrubs that belong to the holly family, Aquifoliaceae. Hollys have glossy, evergreen or deciduous leaves, small, inconspicuous flowers, and bright red berries. In Scandinavia, the evergreen varieties were revered; a sign of defiance to cold and a symbol of life’s continuity. Holly was thought to be the home of wandering spirits. It was hung in homes to assure the occupants good luck. It was assumed that the "points" would snag the evil-intentioned and prevent their entering. When holly was brought into the house, it became an object of lively interest and speculation. It was (incorrectly) believed that the very sharp "pointed" leaves were male, the smoother, female. Thus, the type of holly determined who should "rule the roost" in the coming year. Victorian merchant, Henry Mayhew estimated that London merchants sold 250,000 bushels during the 1851 Christmas. It supposedly wards off witches. A Syrup made from holly allegedly cures coughs. A spring of holly on a bedpost assures one of pleasant dreams. Many, many other such myths also exist. Christian tradition assigns significance to Holly. According to tradition the pointed leaves represent the thorns of Christ's Crown. The perennially-green leaves represent eternal life. The red berries represent the blood He shed for our salvation. There is even a tradition that holly was used to make the crown of thorns. At that time the berries were yellow. In honor to the blood shed by Christ the berries turned red. While holly is most often pictured as having red berries the berries come in other colors too. One tradition says that white berries represent Jesus purity, green berries the cross of wood, and black berries his death. Many holly species have the pistillate (berry-bearing flower) on one plant and the staminate (pollen-bearing flower) on another plant. Hollys bear fruit best in colder climates and can withstand most freezing temperatures. American holly, Ilex opaca, a slow-growing evergreen tree, can reach heights of 18 m (60 ft) at maturity. Holly trees can live for 200 years. The leaves are stiff and deep dull-green with spines on the margin. The bright red berries ripen in October and remain through winter. English Holly, Ilex aquifolium, is similar to American holly but has glossier leaves and larger clusters of berries. It is not as hardy as American holly.